Signature Series Planters seamlessly connect beautiful plant life with modern architecture and landscapes. 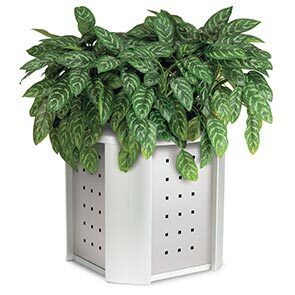 The sleek and refined aesthetics of these 20 gallon planters are defined by the 14-gauge stainless steel panels with 1/2" square perforated design configured together utilizing aluminum corner posts and contour lid. The galvannealed spun steel contour top features a 17" diameter opening and simply secures to the planter base by two 8" braided nylon straps. Accommodating for portable or fixed applications, the planter's legs have plastic end caps to protect flooring or supporting surface. Reusable plastic liner made of black high-density polyethylene is included.